It is time to call a winner on the Livewire 2017 outlook series stock calls. To recap, this time last year, we asked readers to participate in our survey, the final part of which was a stock pick. There were over 630 submissions, with more than 230 different stocks named. The average market cap of the picks was around $5 billion, and the average gain across them was 9% over the year. Being small cap heavy though, most of this performance came in the last quarter. With some stocks getting multiple nominations, this year the top spot looks to be shared by four readers. Read on to see who took the podium for 2017, and be sure to submit YOUR stock idea for 2018.
a2 Milk has been a truly remarkable story to follow this year. With a 224% gain ytd, this roughly $5 billion stock has been the top performing stock on the ASX200, well ahead of the other ASX200 leaders: Costa (+96%) and Next DC (+89%). This strong showing has also propelled a2 as the top pick in the Livewire 2017 Outlook survey, and was in fact tipped by no less than FOUR astute readers: Donald Hammond, Sean S, ‘AF’, and ‘FN’. Congratulations, and we look forward to sending you a free ticket to Livewire Live 2018.
a2 Milk has also been a favourite among Livewire contributors this year. You can access the full year of commentary on the stock, including recent views from Greencape Capital, Schroders, OC Funds, Wavestone Capital and Fidelity, by clicking here. What could be in store for the stock in 2018? 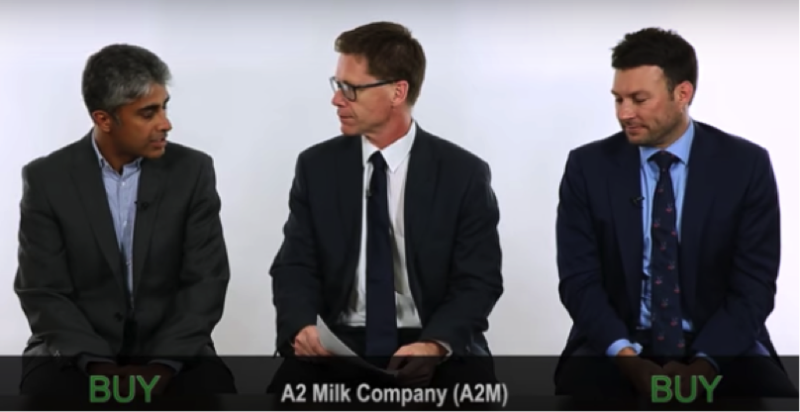 In November, Andrew Mitchell from Ophir Asset Management and Prasad Patkar from Platypus Asset Management, both called a2 Milk a ‘buy’ in an episode of Buy Hold Sell. Andrew Mitchell said: “We love it, it’s a Buy. 4.5% market share in the Chinese $15 billion Infant Formula market, and we think its going to 10% market share. It’s a Buy”. Prasad Patkar followed with: “I think it’s a buy. The momentum behind the stock’s earnings is phenomenal, and you wouldn’t want to bet against it at the moment. So it’s a buy”. Kidman Resources was tipped by one reader, unfortunately, due to its late addition to the list we’ve been unable to contact them. Kidman is developing the Earl Grey lithium deposit at its JV project with global chemicals giant, SQM. A special mention should be made about late surprise, Freedom Oil and Gas, as this shale explorer / producer has moved from the back of the pack in the last furlong, to take second place. This was picked by Matthew Clarke from Morgans, who tipped it again for 2018, saying that: “It's fully funded and I think the risk is to the upside for the oil price”. Updater was tipped by Tony M, Dave R, and has been another stock that has made more than three times investors’ money this year. The company facilitates the process of moving house, and has captured significant market share in the US already. Contributors have been growing steadily more bullish on it through the year. You can track their views over time on the site by clicking here, including a recent positive view on it from Executive Director at IFM Investors, Neil Carter. “Let’s say they are doing 5 million moves per annum, if they can monetise at a rate of $100 per move, that would be a revenue of $500 million per annum, which would obviously make it a very valuable company”. The third annual Outlook Survey is now open! Share your view on eight big issues and your #1 stock pick for 2018. We’ve put these same questions to a panel of prominent contributors, and by completing the survey you will get first access to their stock picks. Last year readers correctly called the overall move of the ASX200, the Domain spinoff, and the resurgence of Chinese consumer stocks. However, our panel of experts managed to beat the ‘wisdom of crowds’ in the stock picking competition. So, see how you stack up against the professionals in 2018. By completing the survey, you’ll be in the running to win tickets to Livewire Live, which sold out in record time this year. What would have been a MUCH more interesting article would be to look at the average return of all member picks and see if they out / under performed the ASX200. What you have done instead is have a big group of members at the start of the year selecting a big group of stocks... and surprise surprise... some went very well. An entirely pointless article. Hi Andrew, the point, as the headline clearly indicates, is to announce the winners of the 2017 stock picking competition so we can give those people their tickets to our event. As the readers choices were "small cap heavy", the average gain of 9% did not compare well with the Small Ordinaries Index gain of 16% for the 12 months to the end of November. As the small end of the market is the one place where the fund managers appear to be able to consistently beat the index, the lesson for readers should be obvious.